Jumpips EA is a fully automated strategy that executes market order when the price jumps above or below on the desired pips distance within the time limit required. It can set as a scalping EA or a grid type EA. Modes: I will provide set file for the setting. Scalping Mode will Close the trade on a tight stop loss and trailing stop. Smart Grid Mode, if activated a grid trade will only open if the desired pips distance within the time limit required and the minimum distance is met, this is made to avoid excessive opening of grid trade if the trend keeps pushing against its favor. You can attached it on any time frame. Trades on all types of pairs default settings works efficiently on GBPUSD and EURUSD. Works on all types of Account type and Broker, default settings are optimized for standard account. Default parameters are optimized for leverage 200:1 or more but it works on any leverage. Back test only on Every Tick. Magic Number - Number to be Identify by the EA to managed trade with the same magic number. EA Mode - The Option to choose Scalping and Smart Grid. Jump Seconds - Time to achieved to open the initial trade. 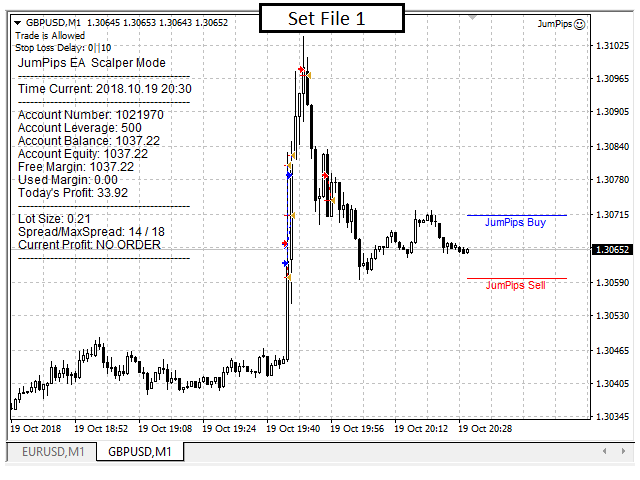 Jump Pips - Pips to achieved to open the initial trade. Smart Grid Jump Seconds - Time to achieved to open the smart grid trade. Smart Grid Jump Pips - Pips to achieved to open the smart grid trade. Grid Minimum Distance Pips - The minimum distance from the last trade to open a smart grid trade. Max Open Trade(Grid) - The maximum open trade to open a smart grid trade. Maximum slippage - The Maximum slippage you allow to open and close trade. Maximum spread - The Maximum spread you allow to open a trade. Fix Lot Increments(Grid) - Increment Lot Size if smart grid open, Trades Count multiply by Fixed Lot. 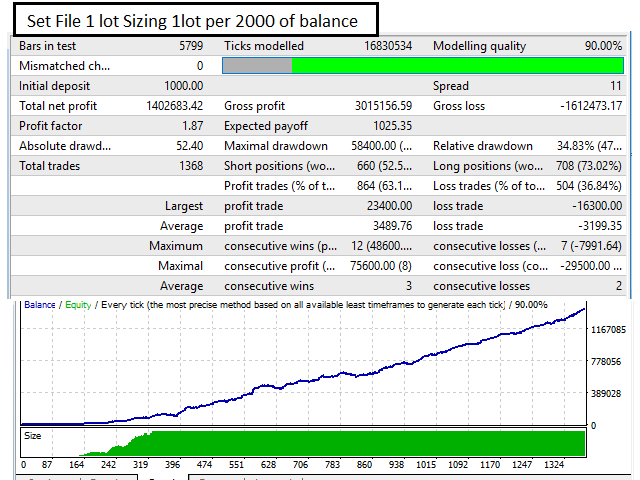 Lot Sizing 1 lot per $ balance__ - Input Value (1,000 - 1,000,000++ ) . Lot Size - Initial Lot Size. Minimum Account Currency Equity Level- The minimum account equity level, if the account equity crosses below this level all open trade will be close and it will no longer open a trade. Order Stop loss - Market Order of Stop loss relative to ask or bid when order is executed. Stop loss in Account Currency value - Stop loss base in account currency level. Stop loss in % Equity of balance - Stop loss base in floating loss percentage of account equity. No Stop Loss - No stop loss. Order Stop loss Pips - Value. Order Stop loss Seconds Delay - This is made to avoid immediate closing of trade specially on widening of spread after an order is executed. Stop loss in Account Currency value - Value. Stop loss % Equity of balance - Value (1-100). Order Take Profit - Market Order of Take Profit relative to ask or bid when order is executed. Profit target in Account Currency value - Profit target base in account currency level. Profit target % Equity of balance - Profit target base in floating profit percentage of account equity. No Take Profit - No take profit. Order Take Profit Pips - Value. Profit target in Account Currency value - Value. Profit target % Equity of balance - Value (1-100++). If Order type Buy, Price moves to your favor by (Order Open price Plus Trailing Start Pips ++), Stop Loss will be modified to (current bid price minus Trailing Stop Pips). 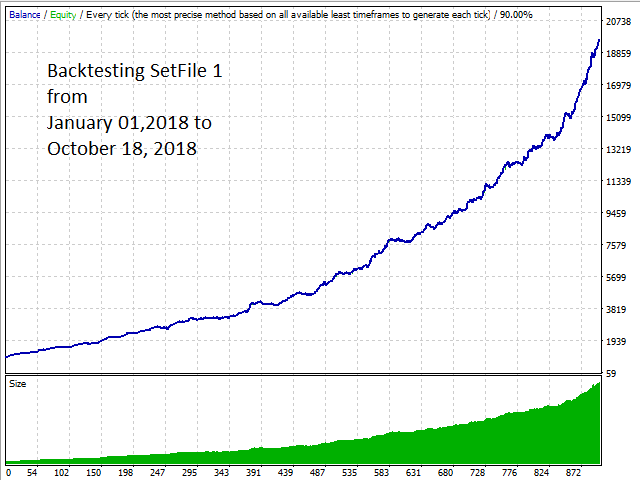 if Order type Sell, Price moves to your favor by (Order Open price Minus Trailing Start Pips --), Stop Loss will be modified to (current Ask price Plus Trailing Stop Pips). Description is max 3600 characters. if you bought this EA just message me for further details . properly delete the smart grid line and level line if not needed. Ontrend - Executes buy if the price moves upward and Executes sell if price moves downward within the period of time required. Reversal - Executes Sell if the price moves upward and Executes Buy if price moves downward within the period of time required. Added mode type Level Grid. this mode will open a virtual Limit order on the desired distance you set on input "Level Grid Distance Pips"
-Lot Sizing Increments(Grid) increment lot size base on the lot sizing of initial lot size to be use in grid mode.